Lysergic Acid Di-methyl-Amide | I am Piyush verma’s work Life. I am Piyush verma’s work Life. SOC end’d last night, and a last minute savior from my ever helping mentor Andreas, I get some Highlighting working. And yes i got screenshots to paste. And i was nearly ready with the codes which i expected to work, and a small work around from andreas ensured they indeed worked, and things didn’t go in vain. Code Highlighting is working at a very basic level [ The screen shots might narrate that better]. I am currently working with creating a Definition Use Chain for Python, which once gets done the editor jobs should be pretty easy to accomplish, I thought it to be relatively easier but what i had pre-assumed that it already existed for Ruby another languages was not correct, it only exists for C++ and it took me almost a week to understand the basic structure of what was to be done and How. We are done with an editor integrator for Python like it existed for CPP, and the current job is to design a context builder, which is nearly half way done. Day5: Did i say ‘WooHoo’ ? Day 5: another slog till 4 AM last night, Another day of illness. But it seems like paying now. Just a few small lilltle changes to the code, as per they had been done for C++ & Ruby, i try doing the same & here are the results. The File is loading up and it is parsing it in the Background and displaying the result as well. This deserved a “woohoo, how did i do it?”. Day 3 into the Plug-in work for Kdevelop4. And i still find myself crawling, but only till last night. Goals Reduced, deadlines extended & Pressure eased…and by the end of morning, i could handsomely grasp the idea behind intended. 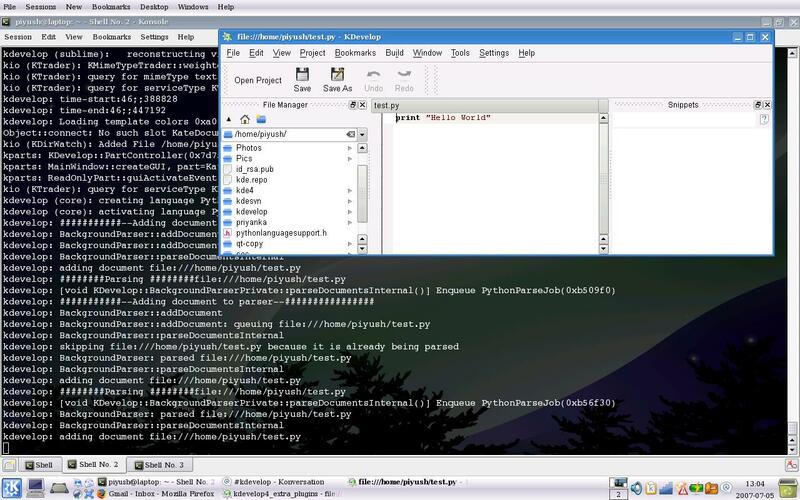 And i added a parseclass to the plugin which could handle request on loading a Python file. The Plugin loads the ParseClass whenever it encounters a .py file. 1. Extend the ParseClass beyond kdebug(). 2. Make the ParseClass parse the code and display, any Success or Failure . 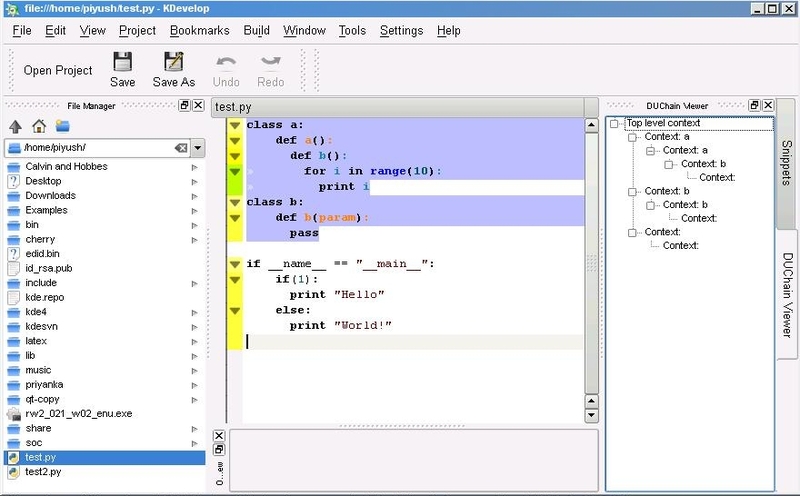 Here’s the first snapshot of the python plug-in being a part of kdevelop4. I Parsed a small file, and it printed the required kDebug messages on the konsole in backdrop. Nothing of a Deja-Vu although, but after i found myself struggling heavily in this stage of the project where i found it difficult to make pace, the first sign of things working , deserved a sigh. Andreas’ been really helpful and does take out time every time; to resolve all my doubts and bugs, some obvious and many others just a bit Foolish 🙂 Last Night i woke him up till 4AM to get this plug-in working. Which obviously he saw it working last night itself, but I was again struggling till today afternoon. As days pass, the Tasks start getting tougher and i hope to post more of the good work.